Australians don’t take themselves too seriously. This means we are quite comfortable having a laugh at ourselves. For example, we like to build big statues or monuments of the things which are important to a town or a region. We call them the ‘big things’ of Australia. I’m not talking about normal statues of famous people which you find in parks and squares all around the world. I’m talking about big versions of, say, a fruit such as an orange or a pineapple, or a big version of an animal such as a crocodile or a sheep, or indeed a big version of some other item important to a town or region, such as a guitar or an axe. Whether you call them structures or statues or monuments or whatever, the key points are that they are big and they are important to the town or region. People are really having a bit of fun when they build these things. They know it will attract attention, make people smile and, importantly, it will help put their town or region on the map. It’s actually a form of advertising but it is also just another example of Australians having a laugh at themselves. In this podcast I would like to tell you a little about a few of the best known ‘big things’ in Australia. It is estimated there are more than 150 ‘big things’ all around Australia. To check out a full list, the article in the Wikipedia is a great place to start. Just do a Google search and you are sure to find it. The Big Merino is a giant sheep located in the New South Wales town of Goulburn. This is one of my personal favourites because it is located close to Canberra where I once lived with my family for 3 years. I can still remember seeing the Big Merino for the first time. It is indeed impressive. It is a likeness of a male Merino sheep with a full fleece of wool. It is 15.2 metres high and 18 metres long and is made of steel and concrete. It weighs around 100 tons. Attached to it is a large gift shop and if you venture inside the actual sheep you will find an exhibition about the wool industry in Australia. The Big Merino was first built in 1985 as a monument to the town of Goulburn and to the wool industry in the district around Goulburn. It was moved 800 metres down the road in 2007 to be closer to a new highway bypass. The gift shop sells a large range of gifts and clothing. Of course, it also sells a full range of products made from Australian wool. If you go up the stairs inside the Big Merino to look at the wool exhibition, you can learn about the wool industry in Australia and also see how wool is processed so that it can be made into fine wool products. It is also fun to go to the top of the stairs and look out through the sheep’s eyes to see the view over the countryside. Another famous ‘big thing’ is the Big Pineapple which can be found on the Sunshine Coast in Queensland, in a town called Nambour. Queensland is famous for its pineapples and the Big Pineapple reminds everyone of that fact. The Big Pineapple is 16 metres high and has two levels inside. It has a viewing platform on the second level. The Big Pineapple is surrounded by a 165 hectare site and was first opened in 1971. It has become quite a tourist attraction over the years and in 2009 was listed as a heritage site in Queensland. Along with four other ‘big things’, it’s been featured on a postage stamp produced by Australia Post. The site around the Big Pineapple includes a Wildlife Zoo, a café and a heritage train which goes around the Big Pineapple site. The Big Pineapple site is in the process of being redeveloped by new owners and this will no doubt make it even more popular than before. It’s definitely worth a visit. Another ‘big thing’ of note is the Big Banana. This can be found in a town called Coffs Harbour in New South Wales. The Big Banana is an amusement park with a toboggan ride, a skating rink, a water park, mini golf, café and more. Of course it also has a Big Banana. It was one of Australia’s first ‘big things’ and was built in 1964. It is 13m long, 5m high and 2.4m wide. But it is really the amusement park where all the fun is to be had. You can also learn everything about bananas at the Big Banana. I haven’t been there yet, but it sounds like a lot of fun. There are two more I will mention. The first is the Big Lobster, a 17 metre tall lobster found in Kingston SE in South Australia, which is famous for its fishing and seafood. The second is the Big Guitar, located in Tamworth in New South Wales, which holds Australia’s famous country music festival each year. But there are so many more ‘big things’ to see. A trip around Australia will soon have any tourist looking out for the next ‘big thing’. Podcast 96 Quiz - Did you understand the podcast? True or False? – Rob says that Australians don’t like to laugh at themselves. True or False? – ‘Big Things’ in Australia show what is important to a town or region. True or False? – Rob thinks that ‘Big Things’ in Australia will make you smile. 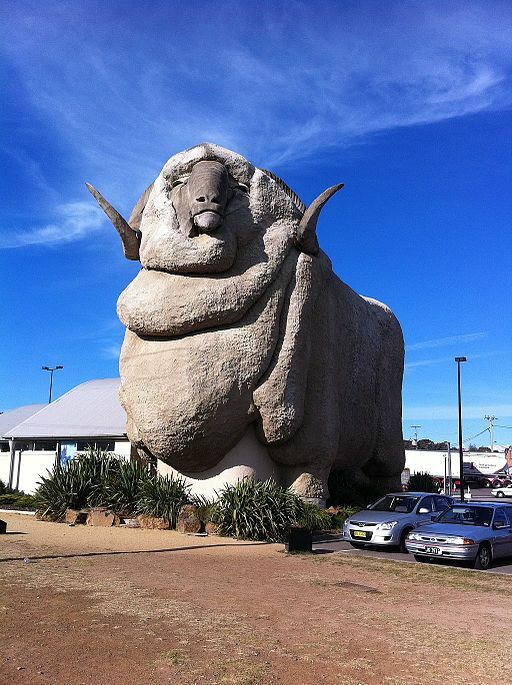 True or False – The Big Merino in Goulburn is one of Rob’s favourites because he used to live near it. True or False? – If you wanted to learn more about the wool industry in Australia, you could visit the Big Banana. True or False? – In 2007 they moved the Big Merino because of a new highway bypass. True or False? – The Big Pineapple reminds people that pineapples are grown in Queensland. True or False? – A picture of the Big Pineapple was put on a postage stamp. True or False? – Rob went to see the Big Banana in 1964. True or False? – Rob thinks that Australia’s Big Things are good for tourism. Wikipedia = a free encyclopedia on the internet https://en.wikipedia.org/wiki/Main_Page.